Nothing like a Snow Day to hunker down and tinker … I started this as a saxophone with notes and then morphed into an animation for my band. I am now thinking I want to do one just for the band, for our website. (That’s us playing, and me on saxophone). The other day, I wrote about the technology hemming me in, and I use a song that I had written and recorded as a demo as an example of why I was feeling that way. Today, I wanted to share what I did with that song, and maybe reversed things a bit. I still liked parts of the song, even though it had been changed irrevocably from what I had first envisioned it as for my band. And I didn’t want to lose it completely. 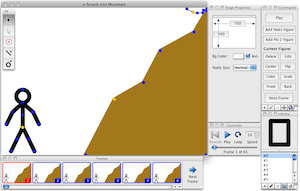 As it turned out, I had also finally gotten around to downloading and toying around with the free Stykz software — which is a sort of updated version of Pivot Stick Figure stopmotion software (both are free). I wondered: what if I created a stopmotion video in Stykz that used the chorus of the song? Yeah. My son was hounding me to create a stopmotion movie yesterday and so I finally agreed, after dinner, to help him get set up. As he started to talk about his “story” (which is something I require him to have in mind – a mental storyboard — before we get started so that it doesn’t just devolve into complete chaos), I realized that he was envisioning a sort of zombie-like story. Which was a strange coincidence, because I was in the midst of playing the Twitter Vs. Zombie game (although no one in family knows it) as part of Digital Writing Month. With a couple of story tweaks, we decided to base the movie around a Zombie King and a zombie factory, and a hero who destroys it and captures the Zombie King. He was the hero. I was the Zombie King. We got to work — using the Smoovie app software to create scenes with Lego pieces, and then iMovie to add narration and music (from Freeplay Music), and then Youtube to publish (he is very conscious already of “views” and maybe that is a topic of another post on another day, given that he is only 8 years old). I shared the final video out as part of the Twitter vs. Zombie game last night, adding our creation into the narrative mix of the unfolding game. My 8 year old and I made a short claymation video (13 seconds!) this morning, using some new software (Smoovie) on our Mac. I’m moving away from my old freeware on our aging PC laptop that works but can get tricky (you shoot in one software and then need to shift to another, and it can be choppy at times). Although it cost me a bit ($30), Smoovie was simple to learn and easy to use and quickly uploaded to YouTube (and it seems like there is an iPad version). Already, my son is curious about number of views he is going to get. I’m a sucker for “behind the scenes” of stopmotion movies, and the making of ParaNorman is interesting because it is one of the first (according to Wired) to use 3D printing technology to create facial expressions for the stopmotion characters. My older son is working on a stopmotion movie for his eighth grade science class around the thought experiment of Schrodinger’s Cat (is the cat alive or dead, or both states at the same time?). The stopmotion element is part of a larger video project that he and his friends are working on for their investigation. But all of the equipment is set up: the camcorder, the computer, the background paper. It reminded me of the power of siblings, and how often the experiences of our brothers and sisters shape our own ideas around the world. I’m not trying to get him to branch out a bit. His next movie, which he again did almost entirely by himself, left the Peas behind, but he is still clinging to the idea of “treasure” as the hook of all of his movie stories. It was nice to see that the Google page is dedicated to one of the pioneers of Claymation Stopmotion — Art Clokey. The Google Search site features the Gumby Google Doodle today, and if you do a little clicking around, you can discover who is hiding in the balls of clay and other odds and ends. (Hint: Clokey was the brains behind Gumby and Pokey). We do stopmotion in our classroom, and some years it is claymation (it all depends on the time we have to do the unit). If you want to know more about ideas around stopmotion animation for the classroom, you can check out my resource site: Making Stopmotion Movies. Here are some of the stopmotion movies my students created this week. There was a mad rush yesterday to get as much done as possible. The one movie that did impress me, and would have been better with more time, is the remake of King Kong, using the black and white effect, and flashlights, and the scale of the figures. These boys had a vision, and I wish I could have given them more time. But, now that they know how to do it, I bet they will be doing stopmotion at home this summer.